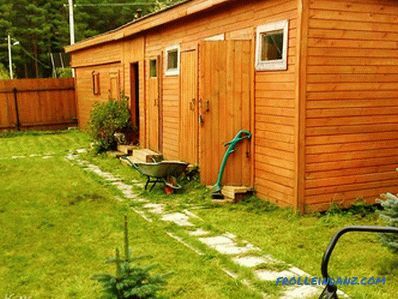 A shed is an integral commercial building on a summer cottage. A well-designed barn can last more than ten years. In addition, you can save well if you build a barn yourself. First of all, to start its construction, it is necessary to draw the future project of a summer residence, and on it specify the location. In most cases, its location will depend on the characteristics of your territory. When choosing a site, consider that the barn will be located in one place for a long time. Therefore, think carefully about where the optimal place for him will be. It is extremely important that it blends harmoniously into the overall landscape of the site. 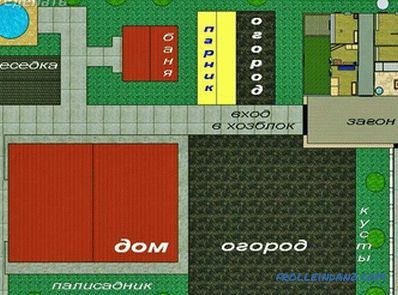 Based on the location of other buildings, for example, sauna, garage. The choice of location will depend on what material it will be made and what its exterior will be. There is more freedom in this matter. The most important thing is that he can fully meet his main purpose. First of all, you need to do a project Because the barn is a small house. You can do it yourself. In the project, you specify the total size, the material used and its quantity, the presence of the roof and its shape, the presence of partitions and the like. Next, you need to decide on the type of foundation. 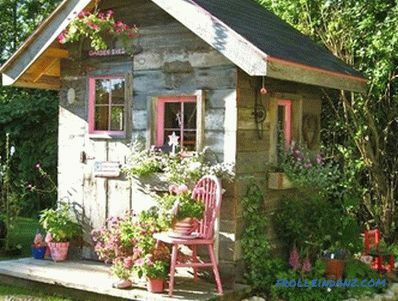 For such a shed, the foundation can be of a different type, since the walls of the logs do not crack. To a greater extent, the choice of the type of foundation will depend on the availability of groundwater, the depth of freezing, as well as on the basic characteristics of a particular soil. The most popular type of foundation that most builders choose is columnar. Why? The reason is very simple. For its manufacture will require a minimum amount of building materials. Moreover, the column foundation is fully capable of making independently. For its manufacture requires the presence of sand, gravel, cement and reinforcement. 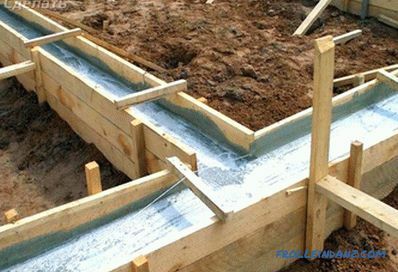 Formwork under the base can be made of roofing material, twisting it in the form of a pipe. This option will be the cheapest and easiest. The first step is to determine the location of the pillars, and first it is important to remove the plant layer of soil, it will be enough up to 25-30 cm. It is extremely important to have a pillar at each corner of the shed, with an interval between them in 1500-3000 mm. Based on the level of soil freezing, a well is made using a garden drill. After, a pillow of sand is made on the bottom of the pit, with a layer of 200 mm. When the well is prepared, the previously prepared roofing material is placed in it, which will act as a formwork. A fabricated framework of reinforcement is inserted into it. The length of the armature can be put 3-4 pieces. 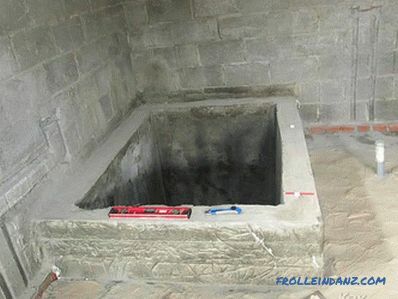 It remains to make concrete and pour it into the well. After complete drying, the columnar foundation is ready. Before you start building walls, you need to lay a strapping crown. Previously on the ready-made columns go ruberoid. It is desirable in several layers, so you make a waterproofing. Then on them, along the perimeter, the bars are impregnated with antiseptic. At each corner, the bars are joined with the help of a dowel. Before laying the next row of bars it is necessary to put a heater, for example, tow or jute. Please note! So that the future barn can be easily sheathed with siding, as well as additionally warmed, the bars should be joined “in the paw” in the corners. Using nogue, connect the crowns. 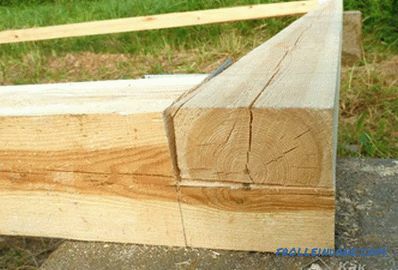 To do this, several holes are made in each crown every three beams. A “stick” of 3-4 Ø mm is inserted into the holes made. So that in the process of shrinkage no cracks appear, their length may be less than the depth of the drilled hole. When the height of the walls corresponds to your project, it remains to put beams, and lay on them overlap. The shape of the roof can be shed. To do this, one side of the barn immediately raises above the other. If you want to make an attic or a hayloft, you can make this climb from the base of the roof ceiling above. Construction begins with laying the foundation. Before pouring the foundation, it is necessary to clean the area from fertile land and deepen to a depth of 500 mm. Then a pillow is made uniformly all over the plane, for example, from gravel and sand. Further, a small layer of rubble is evenly filled, which must be compacted.Rebar is laid for the bundle, and later solid concrete is poured. After the concrete has dried, the next floor is prepared. For this purpose, concrete blocks are placed around the perimeter. Using a level, make sure that the top points of the blocks are at the same level. After this, a frame is laid on these blocks, which is the base of the floor. When the frame is ready, made of bars, additionally fit the cross bars every 300-400 mm. Already prepared frame must be fixed with the help of corners and screws. About what to make the floor, will be discussed below. When the base of the floor is ready, you can begin to manufacture the frame for the installation of sheeting. Based on the planned height of the barn, vertical racks are prepared. Also take care of the horizontal bars. They will be required to give the structure greater rigidity. After the manufacture of the frame, begins profiled fasteners. It is fastened with screws. As a rule, an average of six screws will be used per square meter. Without fail, sheets are overlapped by 20 cm. At the initial stage of work, the walls can be insulated from the inside. As for the interior walls, it can be done in a very different style, this will be discussed further. 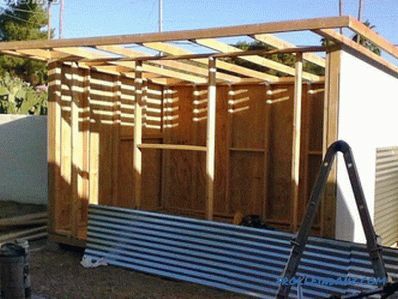 Well, and the last stage of the work is the construction of the roof of the shed. The first thing you need to decide whether it will be, shed or gable. If shed, then this is the easiest and fastest option. But if you want to make an attic room, it is better to make a gable roof. On the roof, you can also use decking. However, unlike walls, it is better to use a professional flooring with polyester coating on the roof. This will create additional corrosion protection and also give a more attractive look. Installation of sheets is carried out on the crate with self-tapping screws with rubber gasket. It is also laid overlapping 200 mm. You can warm the roof as needed. 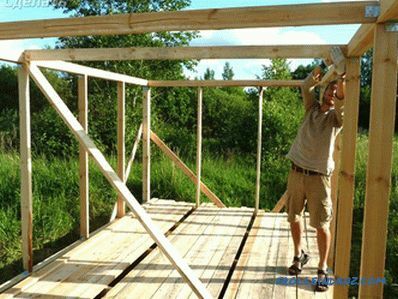 If you want to build a massive and durable shed, then foam block is the perfect option. For such a barn is best suited strip foundation. The first thing you want to thoroughly clean the surface of the fertile layer. After the marking is done trench. Its width can reach up to 500 mm. It is imperative to maintain the right angles. A trench is being dug to a depth of one meter. Its bottom is covered with sand in thickness up to 400 mm, and then it is poured with water and rammed. The next stage will be the construction of formwork from boards. Its height should be measured from the ground at about 200 mm. Using reinforcement and wire, the reinforcement cage is made. At one time, the entire tape is filled with concrete. 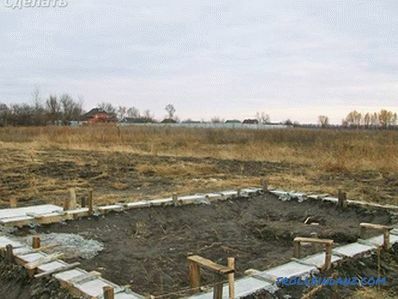 After pouring, the finished foundation is left covered with a film for several days to dry completely. If the air temperature is too high, the base is moderately watered every day. After it is completely cured, you can begin building walls. 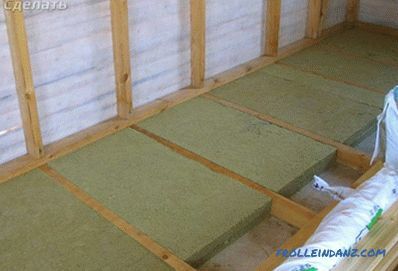 Before you start laying foam blocks, a waterproofing layer is laid on the base of the strip foundation. For the construction of blocks, you can use a cement mixture with sand. Please note! If you use a special glue for laying, the seams will be small and neat. For dressing, each row is laid with an offset of exactly half of the block. It is necessary to start laying from any corner of the shed. For this purpose, the corner block is most often used. In the process of building walls, it is important to use the building level. They checked the vertical walls. 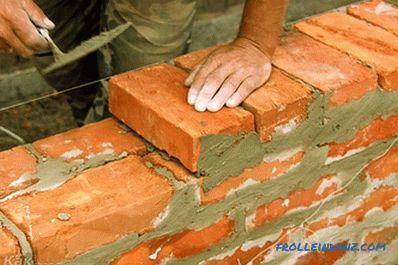 If you do not do this, you will have to spend money to buy building material, which can be used to level the walls both outside and inside. To saw blocks, you can use a special hacksaw. Due to the fact that the foam block has the correct geometric shape, as well as the same size, you can build a barn quickly and that the most important thing is high quality. When the walls are ready, you need to start making the roof. It does not require large investments. You can make a shed roof, covering it with the usual slate. A guide bar is installed along the entire perimeter of the walls. Between it, beams of overlap are placed 100 * 150 mm, at a distance of one meter. Vertical racks are supported by rafters. To most effectively distribute the load, the rack can be positioned in the middle of the rafters. Slate overlaps on the made frame. It is fixed with slate nails. It remains to perform finishing work. 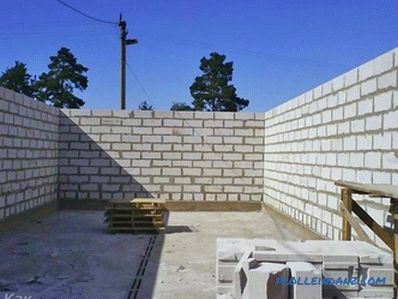 As for the brick, this The most popular building material used for the construction of the shed. This is due to the fact that it has many advantages. For example, it is durable, durable, practical in operation. It should be noted that, both for foam blocks and for bricks, an ideal option there will be a strip foundation. How to make it mentioned above. Consider why we need such a solid foundation. First of all, it is great in cases where the soil is wet. 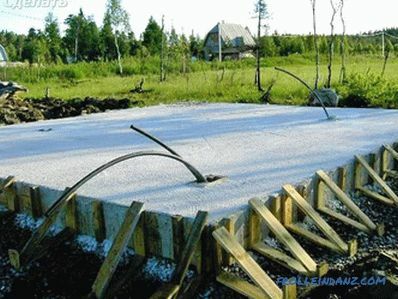 This foundation is able to withstand the additional load. For example, you can build a loft. Moreover, some above the barn decide to just make a flat roof, and they place a gazebo on it. It will be a great place to relax. There is also an option to install a dryer for fruit or simply make an arch under the grapes. All this will be possible thanks to the strip foundation, which can withstand a large load. One of the important works is the forcing of the walls. For this pre-made waterproofing. When laying will be enough half-brick of silicate brick. Based on weather conditions, the solution is prepared according to the technology. Please note! Do not rush, expelling the walls at a time. Expel the walls can be for three visits. This is done so that the wall does not float. When laying bricks, it is important to immediately grind in while the mortar is fresh. 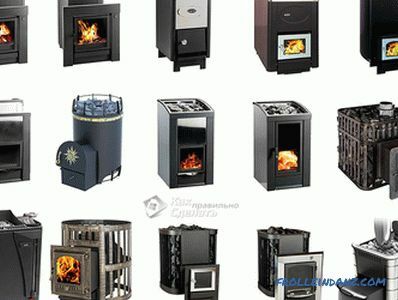 At construction ventilation is immediately equipped. This is important because the air inside will not stagnate, and the room will also dry well. When the last row is ready, it is advisable to fill in the armopoyas. It will securely hold the entire structure around the perimeter. After installing the roof. As in the case of a foam block shed, the roof is made similarly. The only thing is the choice of roofing material, as well as the type of roof. 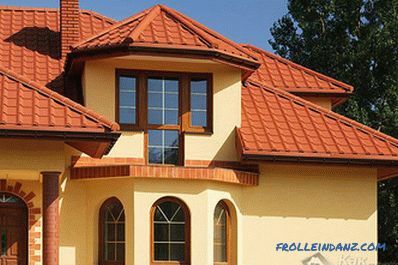 There is a large variety of coatings for roofs, the most important thing is to achieve high quality work, namely good water flow and tightness. In this case, your barn will serve for many years. As for the finishing work, then this will be discussed further. 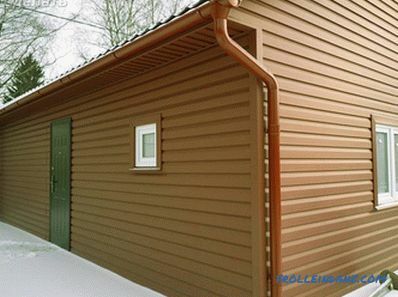 Thanks to the developments of technologists and engineers, it is possible to decorate your summer cottage in an original way with all sorts of prefabricated plastic panels. When assembling them, no special construction skills are required. Their assembly is carried out according to the principle of the children's designer. Plastic can make a variety of sizes and shapes of the barn. The most important thing is that you can build it yourself. This technology is based on a metal frame. As for the walls, floor and roof, they are made of frost-resistant plastic. The ridge of the roof is made of transparent plastic. Thanks to this, even in the daytime you can work inside it without artificial light. Thanks to the equipped floor, the shed is completely protected from the flow of groundwater. Accordingly, it will always be dry, and thanks to well-designed ventilation, the air will be fresh. As for the winter season, the whole structure perfectly maintains a lot of snow. One of its significant advantages is assembly time. Even if you have no experience, then on average, the assembly of the structure will take you three hours. Convenience is that at any time the plastic shed can be moved from place to place. 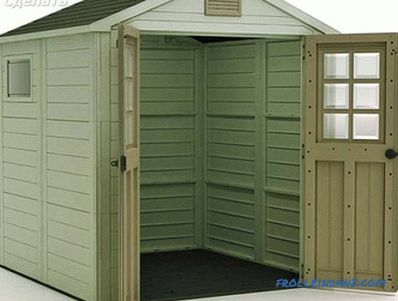 Moreover, the plastic shed does not require maintenance. With careful operation, the service life can be up to thirty years. Regardless the chosen method of construction, it is necessary to select the location of the doors and windows in advance. As for the doors, you can buy them ready-made or make your own. 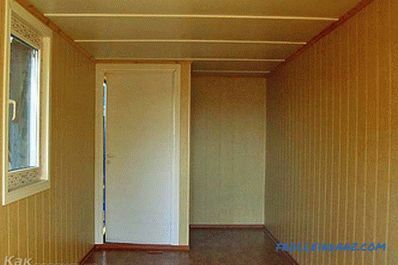 To make the doors, first remove its dimensions. The first thing going door frame. As for the canvas frame itself, it can be made from 50 * 50 mm boards, and a board with a thickness of 100 mm can be laid on top of it. So that they do not interfere with opening and closing, make sure that the boards do not protrude beyond the frame. To increase the stiffness of the doors, on the back side there is a "Z" shape crammed. After the hinges are installed and the canvas is hung on the already installed frame. 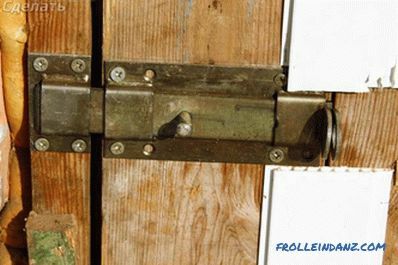 After it remains only to embed the lock and fasten the door handle. 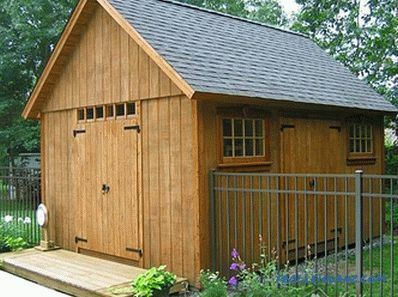 In most cases, the shed is used to store household tools, so you can do without natural lighting. If you want to install windows, then for them to prepare the openings is necessary in the process of making walls. If your barn has a temporary purpose, then the floor will be the ground. 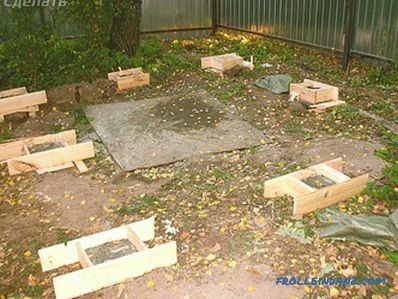 In some cases, the ground can be evenly laid out with boards, after aligning it. If you have built a columnar foundation, then boards with a width of 100 mm will be laid on the installed logs. With the help of nails, they are nailed to the logs. Be careful to nail the boards without a gap, as over time they can shrink and these gaps themselves form. If a solid foundation is made, according to the tape principle, a waterproofing layer is laid on the surface. After stacked lags. At the very end a wooden board is laid, which is equal to the total floor area. As for the exterior finish, then everything will depend on what material you have chosen to build the barn. If it is a timber, then simply varnish it. If the walls of the shed are made of brick or foam block, then the finish is simply necessary. There are many options. For example, plaster walls on the beacons. After the plaster can be painted, lay a tile or decorative stone. Some resort to simple solutions that involve the use of plastic panels. A wooden frame is made for them, and then a quick installation of the panels is made, a groove in the groove. 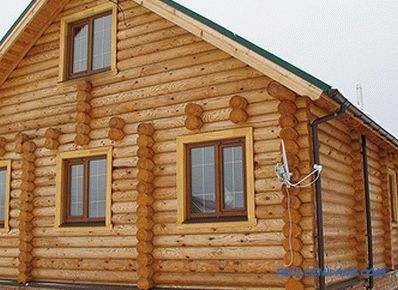 If you do not want to build a barn yourself, then you can buy a barn or a dwelling unit for the dacha. You can choose as budget options, and expensive cabins with shower and toilet.